The 5250/PC and 3270/PC 122 key keyboard can be used with any PC or Thin Client Terminal connected to Microsoft Windows Terminal Server or Citrix. It is driverless keyboard, enabling it to be integrated smoothly in all operating systems. As a result, organizations can look forward to regaining the benefits of true terminal-style productivity. This keyboard is available in multiple languages. Please CLICK HERE to see a list of available languages and countries. 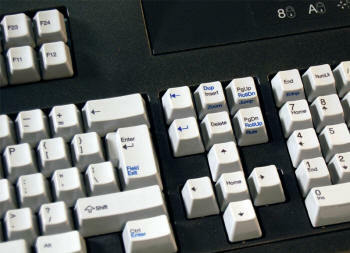 This 122-key keyboard provides a seamless transition from "dumb terminal" green screen terminals such as the IBM InfoWindow 347X, 348X and compatibles from Decision Data, Idea, Memorex, Telex, and Visara, and also from Ethernet Terminals such as Computer Lab international's ET2000. When moving from the 122-key layout to a standard PC keyboard, there are over 25 new key combinations to be learned to perform the same tasks performed with a single keystroke on a Twinax or Coax terminal. This lack of familiarity can produce a big loss in production and excess errors that would not be occurring if the user had their old, familiar keyboard. With the 5250/PC and 3270/PC 122-key keyboards, there is virtually no retraining when moving users from the old "dumb" terminals to new Ethernet connected devices, whether it be a PC or Thin Client Terminal. The user will have the same layout and heavy duty keystroke feel as on the terminals being replaced. No need to learn the new key combinations a standard PC keyboard would require. These "clicky" keyboards are mechanical keyboards using an IBM designed key mechanism referred to as "buckling spring" (illustration at right). This keyboard works perfectly in both the PC and Thin Client environments. Any keys that have different functions are labeled with both functions.